Concentration camps, mass murders, wars, starvation: The history of the Soviet Union is not short of large-scale tragedies and crimes. But in cataloguing these events or counting up the dead, it’s sometimes easy to forget that the Bolshevik Revolution left more than physical damage in its wake: It also destroyed culture, literature, art and science in ways that are not always simple to catalogue, to count or even to explain. Though it is also the story of a man who was physically destroyed by Stalin’s secret police, The Murder of Nikolai Vavilov is primarily an account of these subtler forms of damage. Its hero, Nikolai Vavilov, was one of the greatest of all Russian scientists, a botanist whose work led him, in the early decades of the 20th century, to the cutting edge of the then-new science of genetics. Yet even before his death in a KGB prison in 1943, he had been mentally destroyed by a twisted scientific establishment that valued quackery and political correctness over true science. It was a terrible waste of an extraordinary mind. Educated in the best institutes of czarist Russia and admired by scientists around the world, Vavilov was almost fanatically dedicated to his work. He crossed deserts, climbed mountains and searched five continents in his quest to create what ultimately became one of the world’s largest plant and seed collections. His motives were both scientific and humanitarian. Ahead of his time, he imagined breeding drought- or insect-resistant crops that could be grown in places otherwise inhospitable to agriculture. At first, his passion seemed in tune with the mood of the times. The revolution, in its very earliest incarnation, encouraged new scientific ventures, especially those intended to improve the lives of the poor. Lenin was personally interested in Vavilov’s seed collection and in 1921 ordered the creation of special plant-breeding research stations. That brief moment of enthusiasm quickly waned, as Peter Pringle, a British journalist and longtime Russia-watcher, demonstrates very well. Using a wide variety of memoirs and archival documents, Pringle chronicles Vavilov’s growing difficulties–his botanical institute lacked heat, electricity, funding. Within a few years of Stalin’s rise to power, Vavilov’s work fell victim to the general politicization of science in the Soviet Union and in particular to Stalin’s violent dislike of genetics. Odd though it sounds, there was a logic to this particular Stalinist fetish. After all, the Bolshevik Revolution was founded on a deep faith in the malleability of human nature. Stalin and his followers truly believed that people could be re-educated, that Soviet citizens could be taught to think, act and behave differently from their bourgeois predecessors. It is not surprising that they feared genetics, a branch of science that demonstrates the strength of inheritance and the impossibility of passing on acquired traits to one’s children. Metaphorically, at least, genetics implied that the Bolshevik project was doomed to fail. But Stalin’s suspicion of genetics was not merely philosophical. In practice, it meant that as he rose to power, the Soviet government gradually cut off funding for Vavilov and shifted support to his rival, Trofim Lysenko. Lysenko, one of history’s most brazen charlatans, was a follower not of Darwin but of Lamarck, the scientist famous for his belief that giraffes grew long necks because they stretched their heads higher and higher to reach the fruit on trees. Unlike Vavilov, Lysenko came from a peasant background, which made him a more acceptable scientific star. Lysenko also had no international contacts or admirers, which made him more trustworthy than Vavilov in Soviet leaders’ eyes. Throughout the 1930s, the two men clashed at scientific debates and symposia, but Vavilov’s rational arguments made no headway against Lysenko’s mystical theories. Supported by a Stalinist order to “fight the high priests of science” and to “smash the old traditions, norms and viewpoints,” Lysenko took the top jobs, placed secret police agents in Vavilov’s laboratories and harassed him to the point of illness. Vavilov’s arrest surprised no one. His death in prison, from starvation, went unremarked. Vavilov was posthumously rehabilitated and his reputation restored two years after Stalin’s death in 1953, but the damage was never fully repaired. Genetics remained a suspect and somewhat dodgy area of science throughout the Soviet period, and Russian geneticists never really caught up with their Western counterparts. It is impossible to measure what scientific or intellectual achievements were thereby lost. Yet Vavilov’s extraordinary seed collection still exists in St. Petersburg, more relevant than ever in a world concerned about losing the same biodiversity that fascinated him. And, according to Pringle, the seed bank thrives. It was never, he writes, a “dead herbarium” but a “living museum of cultivated plants, lovingly cared for by loyal and devoted researchers.” And so, one hopes, it will remain. 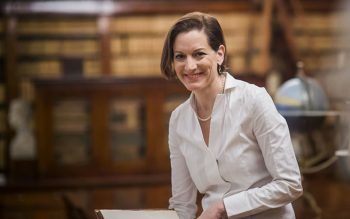 Anne Applebaum is an adjunct fellow at AEI. Nikolai Vavilov, was one of the greatest of all Russian scientists, a botanist whose work led him, in the early decades of the 20th century, to the cutting edge of the then-new science of genetics.